And then there were two. The Patriots and the Eagles rightfully face off for the Super Bowl LII bragging rights for the final game of the 2017 NFL season. The teams are remarkably evenly matched. Each is the #1 seed in their respective conferences. Both were 13-3 in the regular season. Each had a close playoff game and a blowout. The Eagles had a close win over Atlanta and blew out the Minnesota Vikings in the NFC Championship Game. The Patriots blew out Tennessee and then had a close, come-from-behind win over the Jacksonville Jaguars. During the season the Patriots scored one point more than Philadelphia offensively, 458-457, while the Eagles defense bested New England by a single point defensively 295-296. Even? I don’t know how it gets any closer. This year’s Super Bowl will be broadcast by NBC on Sunday, February 4, at 6:30 p.m. ET and can be seen on NBC Channel 10. Al Michaels will handle play-by-play duties with Cris Collinsworth as the color analyst. Michelle Tafoya will work from the sidelines... The game will also be aired on the Patriots flagship radio station 98.5 The Sports Hub with Bob Socci and Scott Zolak on the call, produced by Marc Capello. The Patriots (15-3) came back from a 10-point 4th quarter deficit with Tom Brady firing two touchdown passes to Danny Amendola to beat Jacksonville 24-20. The Eagles (15-3) blew out the Minnesota Vikings 38-7, by scoring 38 unanswered points. Nick Foles threw three touchdowns and the Eagles punched their ticket easily. We here at PatsFans.com are continuing our “Razor’s Edge” column in 2017 to give some quick analysis on some of the key matchups of the game and what you can look for in how the game plays out. The Patriots and Eagles are meeting for just the 14th time. Philadelphia leads the all-time series 7-6. The two teams met once in the Super Bowl already with New England beating Philadelphia 24-21 in SB XXXIX where Deion Branch took home MVP honors with 11 catches for 133 yards. The Patriots running game has been extremely effective with Dion Lewis and Rex Burkhead as a dynamic 1-2 punch that is effective in the passing game as they are in the running game. Lewis will be the main guy in the running game and he’ll have a tall order this week. Philadelphia had the #1 rush defense in the league in 2017 allowing only 79.2 yards per game. The big men in the middle, Fletcher Cox, and Timmy Jernigan make it very hard to run inside, especially where the Patriots like to run by stuffing up everything at the point of attack. 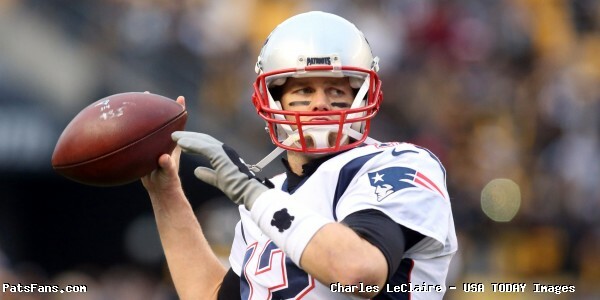 In order for the Patriots to be successful, they are going to have to remain balanced. So play-action passing is key here. Josh McDaniels will have to get a bit creative here, mixing in some draws and Jet Sweeps to take advantage of their aggressive pass rush, but this will be some tough sledding this week. 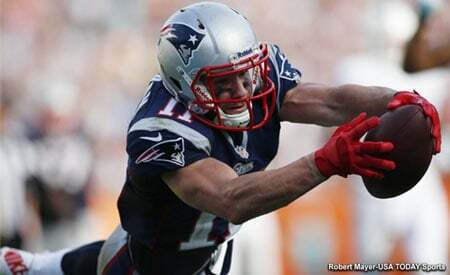 The Patriots passing game will tremendously benefit by having Rob Gronkowski cleared for this game. Although he’s been practicing, as of right now (late Weds. night), he still hasn’t cleared concussion protocol. Tom Brady can spread the ball around with Danny Amendola, Brandin Cooks, Chris Hogan and out of the backfield with James White, Lewis and Burkhead. But having Gronkowski out there and healthy makes it all go. Philly’s pass defense is built around that terrific front four (read seven). They can freely mix things up and substitute. Their subpackage pass rush is especially effective where they move Brandon Graham inside next to Cox and have Vinny Curry, Chris Long and Derek Barnett as edge guys. Protection for Brady will be the key here as the Eagles don’t get tons of sacks but DO get tons of pressure. One area to watch, Philly will probably play much more man coverage in this game. They played a lot of zone during the season and the Patriots, if Brady has time to throw will attack the linebackers with play action and Ronald Darby on the perimeter. Look for them to take some shots down the field early. The Eagles have two very good and varied backs in LeGarrette Blount and Jay Ajayi in the running game. Philly is using both in a committee approach and goes with the hot hand They are very effective at running the ball averaging 132.2 yards per game. The Patriots run defense has been terrific down the stretch and into the playoffs. With Malcom Brown and Kyle Van Noy healthy again as well as the addition of James Harrison, they slowed the running games of both Tennessee and Jacksonville. The Eagles will want to run to take the pressure off of Nick Foles and give him the option of play action as well. While the Eagles will get their yards on the ground, I look for them to slow down the running game and force Foles to beat them. The Eagles passing game was a question mark after Carson Wentz went down with a torn ACL. But Foles has answered his critics with a pair of playoff wins, including a blowout conference championship win where he carved up the NFC’s best defense in Minnesota. The RPO (run-pass option) we’ve all heard about is their bread and butter and Foles has Zach Ertz as the team’s leading receiver at tight end and their go-to guy. But Alshon Jeffrey, Torrey Smith, and Nelson Agholor give them plenty of weapons to throw the ball to. The Patriots defense has been very good down the stretch and the strength is the secondary with Stephon Gilmore, Malcolm Butler and Eric Rowe at corner. Jonathan Jones who recently went on IR may have been a better matchup with Agholor because of his speed but it will be interesting to see how they line up. The key for New England is to keep generating pressure with their front four, where coincidentally the Patriots have had 11 sacks in their two playoff games, something no one is mentioning. And relying on their corners to remain in tight coverage. Containing the RPOs (something Jax ran) requires discipline and gap control. The chess match here should be a fascinating one. Watch for Trey Flowers here, he’s primed for a big game. The Patriots’ Special Teams continue to be among the best in the NFL. Stephen Gostkowski had a very solid season and his pooch kickoffs consistently put opponents deep in their own end. Ryan Allen was the underrated difference in the conference championship game, pinning the Jags deep in their own end ….field position here will be key. Pro-Bowl ST player Matthew Slater on the coverage units. The Eagles are very solid on Special Teams with kicker Jake Elliott and punter Donnie Jones. The coverage units are very good as well but no one’s STs units have been better than New England’s down the stretch. Well, here we go… .This one should be a Super Bowl worthy of its name. As we pointed to above, the teams are evenly matched and both, being the #1 seeds have earned the right to be here. I look for a high scoring game, it may not begin that way, but like the 2003 game with Carolina and New England, I see things heating up. This one will be a back and forth affair. I see Agholor and Amendola having big games for each team. The key for each team will be field position and not be turning the ball over. This entry was posted in 2017 Patriots Postseason, 2017 Patriots Season, NFL Commentary, Patriots Commentary, Patriots News and tagged 2017 Patriots Season, Alshon Jeffery, Big Nickel package, Bill Belichick, Brandon Graham, Chris Hogan, Chris Long, Danny Amendola, Derek Barnett, Dion Lewis, Doug Peterson, Fletcher Cox, James Harrison, James White, Jay Ajayi, LaGarrette Blount, Malcolm Butler, Nelson Agholor, New England Patriots, NFL, Nick Foles, Patriots, Patriots edge rushers, Philadelphia Eagles, Rob Gronkowski, Stephon Gilmore, Tom Brady, Trey Flowers, Vinny Curry, Zack Ertz on February 2, 2018 by Steve Balestrieri.